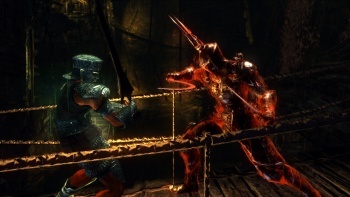 On Halloween, Atlus changed all of Demon's Souls' worlds to pure black. Now, for the winter solstice, the worlds will go pure white. Demon's Souls is an awesome game, everybody knows that, including Yahtzee. The game is hard, wicked hard, and has you taking on boss monsters that are unfathomable at first. On the contrary, Demon's Souls will become a little easier this week if you log into the game's online server, because Atlus is holding a pure white tendency event. Every world in Demon's Souls has a tendency, i.e. condition, ranging from pure white to pure black and this can change depending on certain in-game events. During the Halloween weekend back in October, Atlus changed the world tendency to pure black, making every monster harder but also leading to better loot and soul drops. Atlus is now going to change things up and make the worlds pure white, which means easier monsters and not quite as good loot. The alterations of monster difficulty and loot drops are not the only changes during pure tendency, and in fact they're probably the most inconsequential. More importantly, pure tendency means that certain enemies may disappear (including the giant dragon that killed Yahtzee with its fire-breath), certain doors and paths may be now unlocked that lead to unique items, and unique characters will make appearances. It can be tough to actually attain these tendencies on your own, so it would be wise to log into Demon's Souls this week if you're not up to the task. Atlus' white tendency event is currently ongoing and will run until 12:00 PM PST on December 28, 2009. For more info on tendency, check out the Demon's Souls wiki.